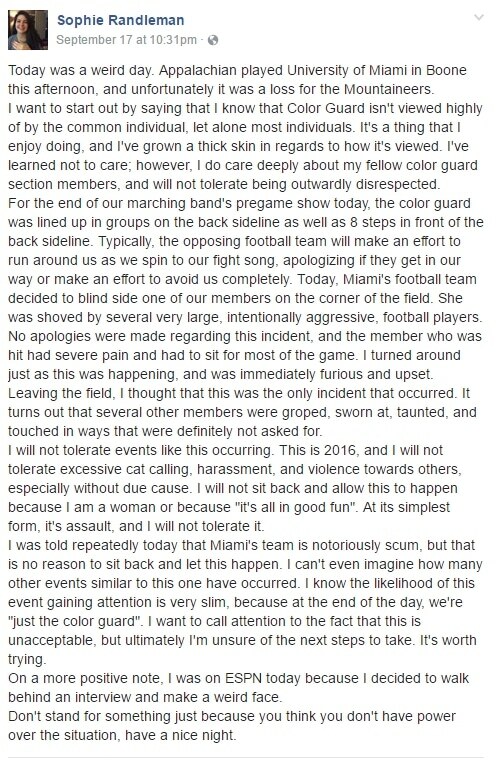 School officials at both Appalachian State and Miami are continuing investigations into an alleged situation involving the AppState Color Guard unit and the Miami football team. WataugaOnline.com received a message from a parent of another member of the Color Guard, just after the alleged incident took place during pregame festivies. That message also stated that some Hurricane football team members had injured a girl but running into her and that other members had been “smacked on the rear end”. A screenshot of the full post by Randleman is below.